If you are anything like us here at Electric Teeth, you like to get a good deal on things. If you can save a few £ here and there it makes you feel good, right? Toothbrush heads might not be really expensive, but when they range from just £2 through to £8 per head, so saving just 50p can seem like a little win. Add up the little wins and over time you could make big savings to bring the cost of brush ownership down, whilst also saving a few pennies for the things you really want to spend your money on. 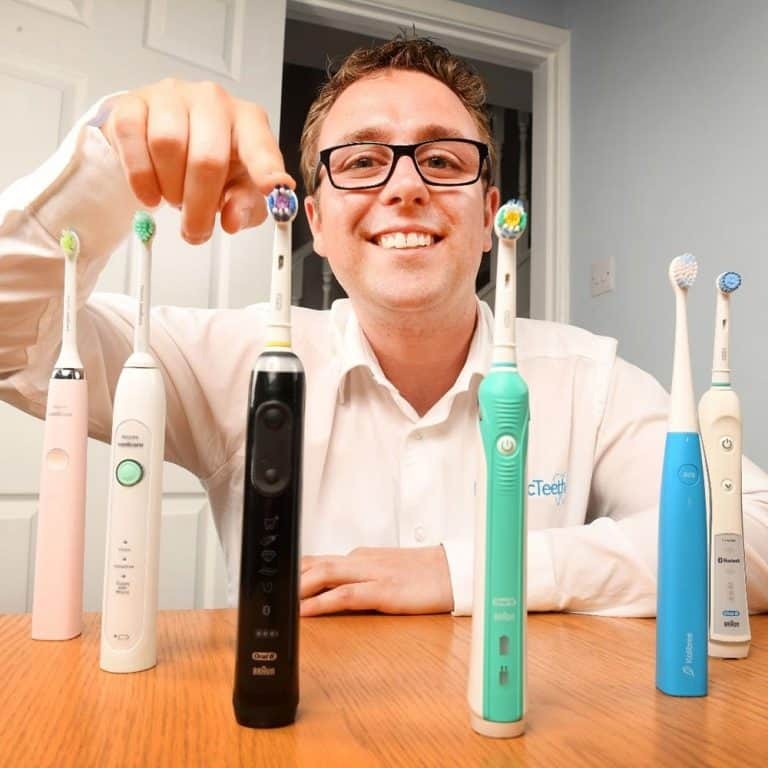 In this article we will give some tips and advice on how to get cheap electric toothbrush heads for your Oral-B, Sonicare or Colgate electric brushes. If you have any of your own tips be sure to share them in the comments. One of the best methods that we have found to save money is to buy in bulk. Bulk buying is a common method across all product types that generally results in a lower price for the more you buy. Now, with a brush head lasting 3 months at a time, you are not going to want to go out and buy hundreds of these, but buying a larger pack or multiple smaller packs at one time can bring the cost down. For example, at the time of writing (prices always subject to change) a pack of 4 x Oral-B Cross Action replacement brush heads costs £11.99 on a well known online retailers website. This makes the price of each head £3. However a pack of 8 is on the face of it more expensive at £18 per pack, but split that by 8 and the cost comes down to just £2.25 per head. That is a saving of 75p per brush head. If you bought 2 of the 4 packs rather than 1 of the 8 packs it would cost £6 more. In our mind £6 saving for an extra click on a web page is not bad going considering you will likely need all 8 brush heads anyway. This is not limited to Oral-B, so let’s look at Sonicare in this next example. A pack of 4 x ProResults brush heads costs £21.53 or £5.38 per brush head. Change the pack size to 8 and the headline price increases to £29.95, but the individual head cost is £3.74. That is a whopping £1.64 saving per brush head and over £13 on a pack of 8! These are just 2 examples from one supplier. Many others will offer the same sort of savings. If you want to be a super nifty shopper, search or look around for any vouchers or promotions that might be going on. There are no set times when these vouchers or other promotional offers will be running but it can be worth checking in every now and again to see what is going on. Whilst vouchers and promotions are always subject to change and differ from retailer to retailer, you might find there are a few extra pounds to be saved. Christmas is often a good time to pick up some deals as electric toothbrushes and their accessories are often discounted around this period of gifting. However, this need not always be the case and some vouchers you need not do any work for. Vouchers can vary from a few pounds (£) off, to a percentage (%) discount or to maybe free shipping if buying online. In the last section on bulk buying we spoke about a pack of 8 x Oral-B brush heads costing £18 per pack. Well this could be reduced by a further £1 simply by ticking a box. Yes, it’s that simple. This retailer was not only was offering a better bulk price for buying 8 brush heads rather than 4, but on the pack of 8 (which is already cheaper per head) a further saving was available thanks to a promotion that required you to tick the voucher box. So here is a double win, a bulk saving and a voucher! A newer but increasingly popular option is a subscribe and save method. A subscription based service it works on the basis of you choosing what you want and how often you want it delivered. It then turns up at your door in regular cycles as you requested. Like a magazine being delivered every month, you can select to have a new toothbrush head delivered at set time periods. You may have a pack of 4 delivered once a year every year, or if you have a family, every 3 months. The big benefit here is that you do not need to remember to order, the retailer does that for you and you win as a result. The retailer gives you the benefit of lower pricing as a thanks for subscribing. The terms of the subscriptions vary between suppliers, but most offer a discount for subscribing and allow you to change or cancel at any point. However, do check this before signing up. Amazon is the largest provider of such a service, but brands like Sonicare do offer this on their own website. Quite possibly the simplest advice we could offer is to shop around. You may have a favourite store, be that online or on the high street, but that does not mean they are cheapest. Sure, feel free to purchase from whoever you are most comfortable shopping with, but be aware by shopping around you may save money. Do not spend too long shopping around though as the time spent looking for better prices may well be outweighed by the savings. Even your own dental practice could be worth a consideration. Whilst buying manufacturer original brush heads is often the preference, there are third party options. Third party or aftermarket options are brush heads made by companies/brands that are not the manufacturer of the toothbrush. Most of us would prefer the manufacturer branded brush heads as then you can be assured of the fit, quality, reliability and performance. However often these come at a price. Third party options can deliver a similar experience, the difference being you tend to pay less because the brand/manufacturer of these does not command the same price. There are many different companies who offer brush heads, but one of the more popular is Molarclean. They make replacement brush heads for Oral-B toothbrushes. Now, unlike Oral-B who have 6 different type of brush heads, Molarclean offer just 1 type, which does mean your choice is a little more limited, but the benefit is the decision process is simpler. At the time of writing 4 Molarclean brush heads cost £8.06 so virtually £2 per brush head. Oral-B’s CrossAction heads are £11.99 or £3 each. That is a saving of £4 in total on just one brush head pack. We have tested Molarclean brush heads and written up our thoughts and opinions in this review. You can check out Molarclean brush heads here on Amazon. Like many others we were pretty impressed with the quality and performance of these as alternatives. Yes, there is sometimes a benefit for going for the branded option, but for the cost savings they are well worth it and the quality is very good. This is just one aftermarket brand we have mentioned, but one of the better known ones. Whilst many other third party options could deliver comparable products do be careful. If something sounds too good to be true, maybe it is. For example, getting 4 brush heads for £1-2, is a lot less again. Whilst this needs to be judged on a case by case scenario, particularly cheap products may be of an inferior quality. That quality may show in several ways. The bristles on the brush head may not last all that long, nor be of a good quality and you may not get indicator bristles either. The physical fit and construction of the head may also be poor and in extreme cases could break whilst in use. We have heard a few horror stories where cheap brush heads have not lasted and even cut the mouth of users because of this. Be smart, question if it is too good to be true. Do you trust the seller? Are you able to find other reviews of the brush heads? It is also worth being aware here of the fake or counterfeit brush heads. They may look like the real deal, be at a particularly good price but sadly are not genuine. It could be well worth a few minutes of your time reading over fake brush head posts, the links are provided below. All being well the tips and advice given above will help you save a few pounds when next shopping for toothbrush heads. If you have any advice, tips or suggestions for other readers, leave them below. We would love to hear them as we are sure some of you have some very savvy tips.